Tadgh Dall Ó hUigín (Blind Taigue Higgins), a professional poet in 16th Century Gaelic Ireland, had seen two patrons suffer ignominy and defeat before he wrote The Lion and Fox for his patron Brian MacGuire in 1588 AD. This poem comments on specific instances of political back-fighting, which were common in the anarchic Clan political systems of Gaelic Ireland. Ironically, because of the fragmented structures of Gaelic politics, within 20 years Brian would be dead, and the world of Tadgh and the Gaelic chieftains would be extinguished forever. Medieval Ireland was a land of two parallel worlds. There was a tribal world where land was under common ownership, and where kingship was decided by complex, mutable laws. There was also a centralised feudal world, represented by the colonial English, where deed and title was clearly defined and where authority came from a centralised and unquestioned source; the King. These two worlds were completely incompatible and in a battle of extermination it was always going to be the world of centralised power, with its clearer unity of purpose that would win. Suffice to say that in the early 17th century when the Gaelic political world was finally and ruthlessly crushed, the creation of Gaelic art, which had flourished for over two millennia if the annals are to be believed, vanished just as quickly. Thankfully there are manuscripts all over the libraries of Europe which contain a legacy of this amazing cultural output. 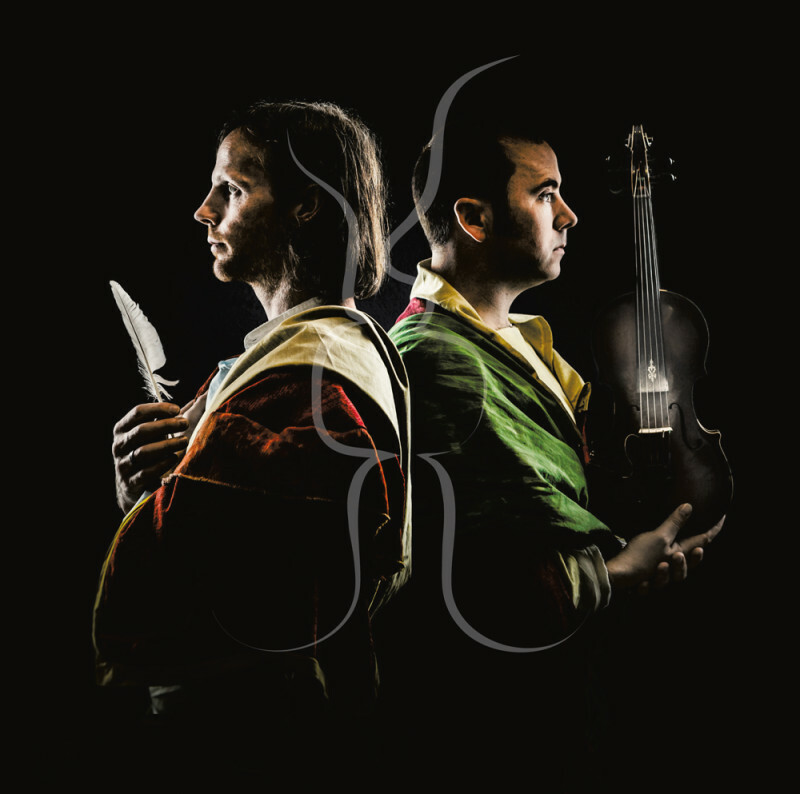 One element of this literate heritage, Sylabic Strict-Meter Poetry, has been turned to a surprising use by traditional musicians Lorcán Mac Mathúna (voice) and Daire Bracken (fiddle). The 12th to the 16th Century in Ireland saw the ‘Dán Díreach’ bring the theories of structured language to a zenith. This form of syllabic, strict-meter poetry, practiced by the professional poet class of medieval Ireland; was so rigidly structured that it seems prosaic to modern ears, but listen closely and you will find incredible rhythms and musical structures which are now being hailed as “pioneering” and “boundary transcending” when converted into musical compositions. This is not poetry set to music; it is the mapping of new musical meters from poetic meters. Poetic meters that are constructed with the same quantised principles as music composition, where syllable replaces note in the construction of complex-rhythm. In a sort of metaphrastic process, Preab Meadar has mapped the syllable to the note, to create unprecedented time signatures from this ancient and forgotten part of Irish heritage. But what exactly is this hidden resource of Gaelic Strict Meter Syllabic Poetry, how did it evolve, and what became of it? The bards, or ‘File’ as they were correctly known, were the publicists of the Gaelic tribal world. Professional poets, intrinsically linked to the political system, they wrote in praise, or satire, of their patrons and their rivals. Their craft was viewed as semi-magical and it was well observed that a well constructed satire could cause sickness in the victim of its scorn. In this atmosphere of politicisation of art the formalisation of the poetic technique took extraordinary bounds, but to understand where this connection between word craft and power come from we must go back to the legend of Amergin. Mythology has it that in the year 1700BC a fleet of ships arrived on the shores of Ireland under the leadership of Míl. They had left northern Spain in search of a new home and amongst them was Amergin; a man who, according to Irish mythology, gives birth to poetry and the magic of structured language, a concept that lasted throughout Gaelic culture right up until the final destruction of this world in the 17th C.
The story recounted in the Leabhar Gabhála Éireann tells of Míl’s bargain with the incumbent inhabitants, the Tuatha Dé Dannan. Of how Míl agreed to set sail and try to return to the shore, only to be met with mist and magical storms at sea. It was then that Amergin the poet began his invocation. His chant broke the magic of the Tuatha Dé Dannan, dispelled the mist and calmed the storm. As Míl’s ships reached the shore, Amergin placed one foot on the land and uttered the final part of the invocation where he announces he is one with the spiritual and existential elements of the land. An interpretation of this is that he is claiming ownership of all these things he claims to be one with. In naming them he is binding them to his will and his destiny, and he is doing it with the magic of poetry. The incantation gives him power over what he successfully names. In doing so he dispels uncertainty. His words are truth and there lies their power as a divinatory of the natural and unnatural. The poet it seemed had a divinatory power, and Amergin’s incantation; a type of spell of binding; is the fable which gives this notion its power. This sets the context for the position of the professional poet in Medieval Ireland. In a tightly regulated social society –for instance your status dictated the colours you were permitted to wear- the world of the ‘File’ was highly structured and regulated, and the clearest manifestation of this was their craft. One consequence of this was that poetry in late Medieval Ireland had become extraordinarily structured and inflexible. It was strict meter syllabic poetry with a multitude of meter typologies. The year 1601 saw the defeat of the last Gaelic chieftains of the North. In 1603 they surrendered to the British at Mellifont Abbey, and in 1607 The Flight of the Earls was the death-knell of the Gaelic tribal culture which had existed since the Iron-Age. Without that political patronage the Gaelic Strict Meter poetic tradition of Ireland ceased almost immediately. This poetry is structurally complex and in an arcane language that is extremely difficult for modern Irish speakers to understand. Most modern Irish speakers would have difficulty pronouncing the language in these poems making the alliterative and strict-meter patterns an enigma. However there is another way of interpreting the patterns within this poetry and making them instantly clear and intuitive. The strict nature of this poetry makes it ideal for rhythmic musical interpretations, as has been begun with the compositional project Preab Meadar. There is a treasury of rhythms in the collections of Gaelic poetry from Amergin to Tadgh Dall and they are just waiting to be used.